STATE COURT E-FILING MADE EASY! Take advantage of FAST, EASY, SINGLE-SCREEN e-filing, and get the support you need by live chat, phone, or email. 0 documents ~ and counting ~ green-filed by 0 filers! You'll find all the standard features you would expect from your e-filing service provider, and MORE, paired with unparalleled support. Please note that the availability of specific features may vary by state. Lean on our support team at any time of day or night, 7 days a week, by phone, email or live online chat. No need to convert your word processing documents to PDF before filing, simply upload them for conversion to text searchable PDFs. Once accepted, your file stamped documents will be attached to your confirmation email for easy access. View basic case and party information, judge assignment, and a register of e-filing activity on your case. Complimentary electronic service and tracking along with your filing. Just identify your service contacts and we'll take care of the rest. Run detailed filing activity reports at any time to view your filing activity and associated filing fees and client matter numbers. We are very excited to use your service. I love that it found our filings and populated everything without anything more than the county and case number, and then found other cases too! so easy! Joe B. (live chat agent) was amazing, professional and an efiling wizard. Yesterday was my first attempt in efiling and I couldn't have done it without Joe's help. I just received an email confirming my successful efiling from the Court! We watched your training video and the system looks great. We have used Odyssey and were not sure how Green Filing would be different until we watched the video. I want to send my compliements on how much easier Green Filing is to use. And the live chat feature to get answers to questions is amazing! I also love that we can simply edit and re-file rejected documents rather than starting over. We are very happy with Green Filing. By the way, your user interface is leagues better than the competitors. And there's no easily accessible live chat feature through Odyssey. In the context of a tech problem that prohibits filing of legal papers, live chat really saves time. I really appreciate that I am able to chat with you so quickly. The other two sites offered on the Santa Barbara web site for e-filing were not as helpful or intuitive as far as navigating through self-help. Thank you. We are a growing debt collection company and currently use Green Filing as our e-filing service provider in the State of Utah. As our company grows, Green Filing continues to work with us to facilitate a more accurate and efficient filing process. We are very impressed with their professionalism and customer service. I just wanted to thank your company for making this process super easy. What states does Green Filing offer its e-filing service in? Currently Green Filing offers service in California, Indiana, Illinois, Texas, and Utah. 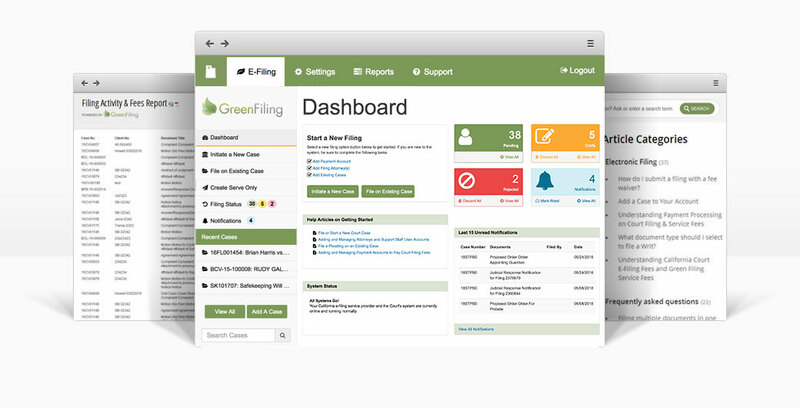 Green Filing started providing e-filing service initially in Utah, and provides service to the Utah District Courts throughout the entire state. Over the past 18 months, Green Filing has expanded to provide service covering the entire state of Texas, and several counties in Indiana, Illinois, and California. Are there any other costs associated with e-filing beyond Green Filing's service fees? Yes. In all e-filing implementations there will be the typical court filing fees mandated by each state's court fee schedule. In Utah, that would be the only additional cost. In California, Indiana, and Texas other services may also apply such as credit card convenience fees, or other Court or County mandated fees. Does your e-filing service also provide for electronic service to opposing counsel or other parties? Yes. In each state electronic service works slightly differently, but in all four states electronic service of e-filed documents is an available feature. Are there any file size limits, or limits on the number or documents or pages contained in a filing submission? Yes. Again each state does have file size limits, and also requires your documents be submitted to the court in a PDF format. The file size limits do differ by state ranging from a max file size of 7MB to 35MB for a single document and 15MB to 100MB for the total of all documents in a filing submission. In all states, there is no limite to the number of documents or pages submitted in a filing submission as long as you do not exceed the total file size limit and all the documents are intended for a single case.